LinkedIn has remained a mysterious social network to many, being dubbed a sales and head-hunting network. With its recent updates, such as native video, LinkedIn is starting to become more of a ‘social’ network. Networking with other professionals has become easier and more attainable. It may seem logical, but the more people you’re connected with, the wider your content will reach, outside your connections. 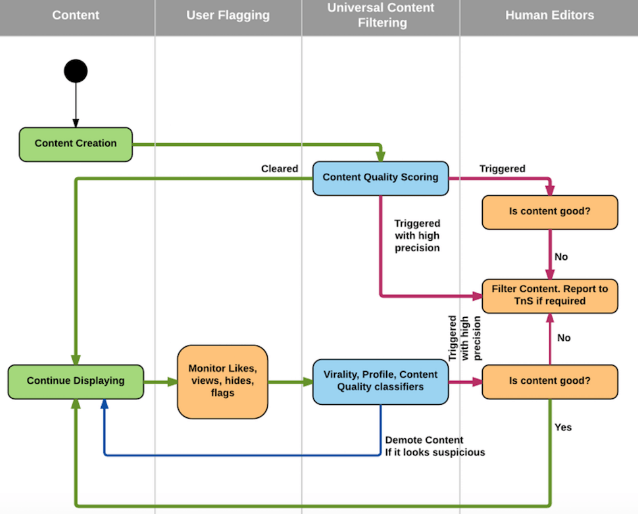 LinkedIn’s engineers recently put out a graphic showing the process of content that is seen in the feed and content that is not seen. The graphic shows that content is sometimes put in front of people and sometimes it is not. Once the user sees the content, there are certain actions that carry different criteria that will determine the quality of the post. If the post receives positive interaction, it is then forwarded to editors for review and to determine whether it is acceptable to be extended beyond the user’s network. This explains why you see a lot of content in your newsfeed that is not from pages you follow and will have a tag from a friend who either liked the post or commented on it. You can’t boost the videos or get in-depth analytics. Rarely will videos ever go beyond ten thousand views. The videos also require excellent copy above because there are no subtitles yet. LinkedIn video still provides a ton of benefits – you get more views than Facebook without paid ad spend.